Photograph collection of webmaster. D5164 with brake tender at Hartlepool. The fifteen year eight month career of D5164/25014 was split between allocations to Eastern Region & Scottish Region depots. October 1971 to Holbeck (55A). November 1972 to Holbeck (55A). February 1st 1976 to serviceable store (at Haymarket). June 1976 reinstated to Inverness. June 21st 1977 to unserviceable store. 25014 was the 17th Class 25 withdrawn. After withdrawal 25014 was noted at Glasgow Works by early August 1977 and had been broken up by the middle of October 1977. 5164 was noted on a Whitemoor - Ely freight on the morning of November 4th, the locomotive then returned light to March. The recorded passenger workings for D5164/25014 are very few. 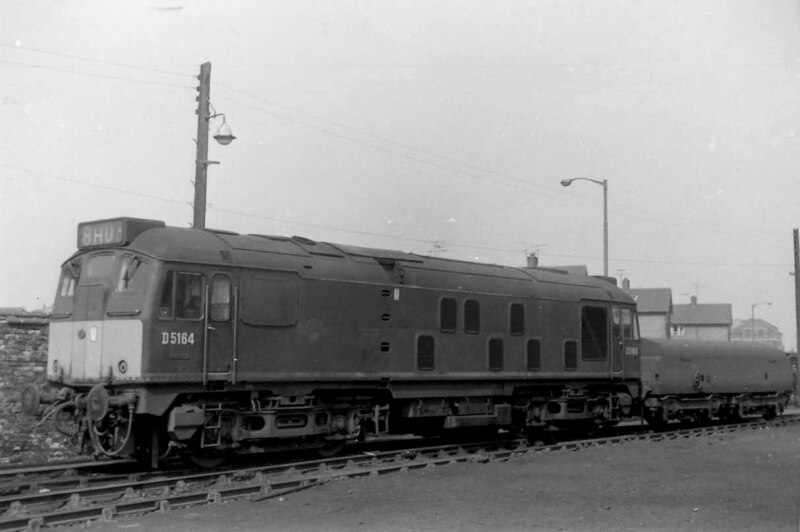 April 28th 1975 found 47116 shutting down in Bradway tunnel with the 15.15 Manchester – Parkeston Quay, the locomotive was revived enough to reach Chesterfield where it was replaced by 25014 which worked through to Nottingham, where 45121 was waiting to go forward. On July 19th 1975 25014 worked the 07.18 Sheffield - Skegness and 10.55 Skegness - Sheffield. Photograph collection of webmaster. 25014 awaits its next turn of duty at Ayr, date unknown. 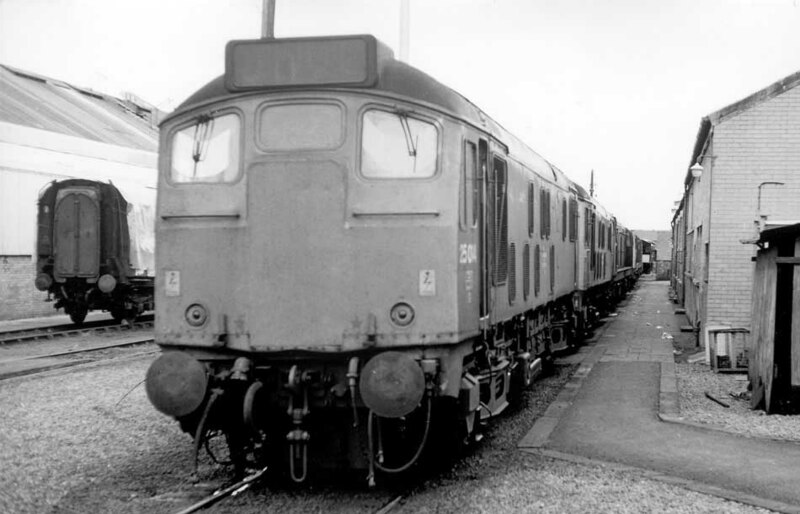 25014 was one of several Class 25/0's put to store during February 1976, then reinstated in June 1976 and working for another year before withdrawal in June 1977. February - marked as a CM&EE Training locomotive whilst at Haymarket. 25014 was stabled on Haymarket in store at lunchtime on May 2nd. 25014 was noted at Ayr depot on March 13th. 25014 was withdrawn on July 20th 1977.